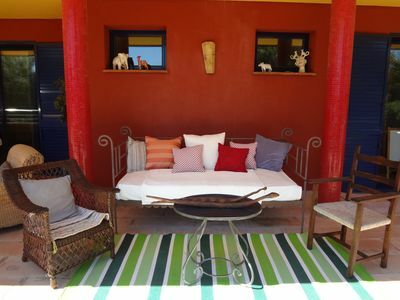 House for groups, events, yoga retreats. Our house is rented for a minimum of 2 days. The price includes all the spaces, from the house, to the swimming pool, the exterior lounges, the work room, the home cinema ... everything. Calima is designed for groups looking for peace and tranquility, respecting the environment and the neighborhood. Not suitable for crazy summer parties. WE DO NOT ACCEPT SLEEPING OF SINGLES, so if we see that we have been deceived, we reserve the right to NOT ADMISSION. There is a double bedroom with its bathroom. A room with 3 single beds, with a complete bathroom. Another room with 4 single beds, with large windows overlooking the garden. We have superimposed wooden beds, with 4 individual spaces, of which 1 has a double bed. They are fitted with latex futons. Upstairs there are 4 more beds, 2 above each booth (look at the photos). We have in total for this part of the space, 5 showers, 6 pilas, and 4 services. There is a luxury sofa bed, sleeps 2 in a warm corner of the large living room. We have a living room with a Home Cinema, ideal for any projection of considerable size. A living room kitchen, fully equipped, magnificent space to enjoy the meals and the moments of social gatherings. The garden is full of mysteries, sculptures, plants and an ecological garden, always full of healthy vegetables. We also have a pinewood area, a paellero equipped with a table and several chairs. On the plot of 3700m2 is also my house, with which, I will be at your disposal although many times, I find myself traveling, especially in August.